Guidance on the running technique of the long-distance runner is provided in the form of a series of pictures and associated notes that highlight the main technical points. The foot strikes the ground below the centre of gravity (which is around the central area of the hips) The strike is slightly on the outside of the heel of the foot and the forward movement is then down the outside of the sole onto the ball of the foot. The leg's role is supporting and driving. As the foot strikes the ground there is also some flexion in the knee. This should not be too excessive, so leg strength must be developed to ensure stability in and around the knee. There is also some movement around the hip girdle. This can be excessive, so strength exercises for the whole region, especially abdominal and lower back are required. It is very important that this region is kept stable thus giving a strong platform from which to drive. As the torso moves ahead of the foot, the drive is initiated and the Achilles and calf are placed under great stress. It is therefore important that stretching and strengthening of this area are incorporated into training. Muscle fibres in the calf respond to a reflex action as they are placed in near full stretch and contract quickly, thus apparently straightening the foot, forcing the athlete up higher on their forefoot. (This makes the foot a further lever, often forgotten by many runners). The foot "grips" the ground as the torso moves ahead, forcing the leg into full extension. Once again, strength and flexibility of the hamstrings are important. After the athlete has reached almost full stretch, a reflex action occurs in the muscle fibres of the hamstring, quickly shortening it and pulling the foot up off the ground. This allows the whole of the limb to swing back a bit further. Hip mobility and the ability to stretch the quads at the front of the leg are also vitally important. The upper part of the leg is drawn forward by the action of the quads and hip flexors beginning to shorten. The foot continues on an upward curve with the help of the contracting hamstring and the hinge effect of the knee joint. It swings into the gluteus maximus (backside) so shortening the lever and making it easier to bring forward. The thigh continues forward and then swings upwards, the head of the foot drops from its high point and accelerates downwards and forwards. The knee reaches its high point, which is not quite as high as that of a sprinter (i.e. at an angle of around 90 degrees to the rear leg). The foot ends its swing through at a point just ahead of the knee. The leg maintains a slight angle at the knee (the leg is not straight). Having reached its high point, the thigh starts a downward swing; this initiates an acceleration of the foot backwards. The foot once again strikes the floor in a backward motion, adding to the athlete's forward motion. Our speed over the ground is determined by the rate at which our feet strike the ground and the length of our stride - both can be effectively controlled by our arm action. The rate at which we move our arms in the direction of travel determines strike rate and the range of our arm action determines the stride length. The arm is a lever hinged at the shoulder and a long leaver is harder to move than a short one. A 90-degree+ bend at the elbow reduces the arm length making it easier to move and control strike rate. In all distances of running the arm action should be active with the hands moving in the direction of travel with a focus on driving the elbows back. The hands should be relaxed with the thumb uppermost lying gently on top of the of the index finger. A relaxed hand will help reduce tension and elevation of the shoulders. 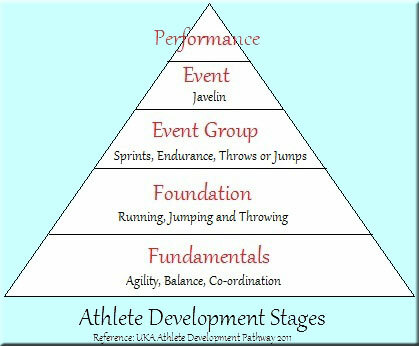 A training program has to be developed to meet the individual needs of the athlete and take into consideration many factors: gender, age, strengths, weaknesses, objectives, training facilities etc. As all athletes have different needs a single program suitable for all athletes is not possible. Quadrathon an excellent all-round test.